As I said in my HLHB Weekly Update, I closed half of my position at 1.2920. I initially wanted to hold on to my trade as I hoped that price would continue trading lower. However, since it didn’t make a new low, I simply took profit on the remainder of my position at 1.2914. Woohoo! I hope this trade marks the beginning of a winning streak. Fingers crossed! 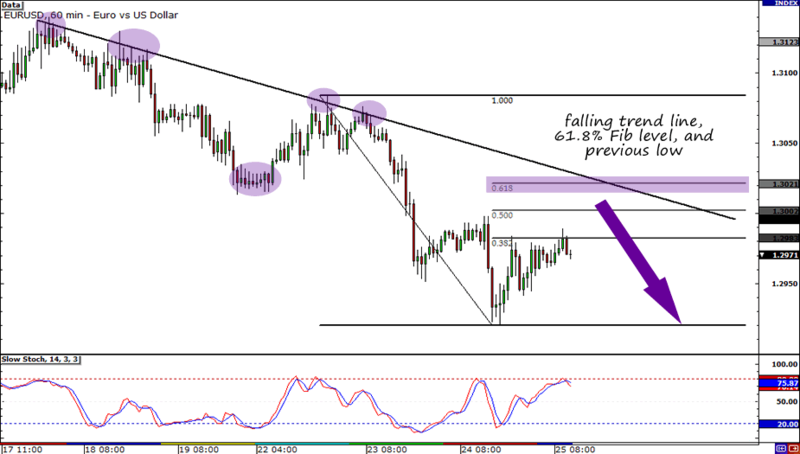 It looks like there’s a bearish confluence on EUR/USD around a previous support area. So this week, I’ll try to score a win by shorting the pair. Wish me luck, pretty please! Connecting the pair’s most recent highs, we actually see that a falling trend line has materialized. I used the Fibonacci tool and realized that the trend line actually coincides nicely with the 61.8% level and last week’s low around 1.3020. Very tempting, eh? Fundamentally, I think that there are also a lot of downside risks, especially when you take into account all the things that are going on in the euro zone at the moment. For one, there has been no request for a bailout by Spain, and there’s nothing to suggest that it’s coming soon. This is very disappointing for market participants, which has led to a lot of “risk off” trades in the last few days. Also note that yesterday’s PMI readings mostly came in worse-than-expected. PMIs are used to see where the economy is headed, so when they are falling, it also means that the economy is contracting. Sell EUR/USD at 1.3020, SL at 1.3085 (above this week’s high), PT1 at 1.2920 (yesterday’s low), PT2 to be determined. 1% risk. Risk disclosure.